Translates vintage XT keyboard actions into a standard USB keyboard. It’s a great way to keep using that favorite vintage XT keyboard! Use with any computer that supports the USB keyboard protocol. Uses standard USB system drivers, no special drivers needed. Powered from the computer’s USB port, no external power needed. Small enclosure can be mounted conveniently out of the way. Connects in line with your XT keyboard and the computer's USB port. Jumper selectable to also convert AT and PS/2 keyboards to USB. Plug and play operation, no programming needed. Custom configurations available. Please contact us for more information. 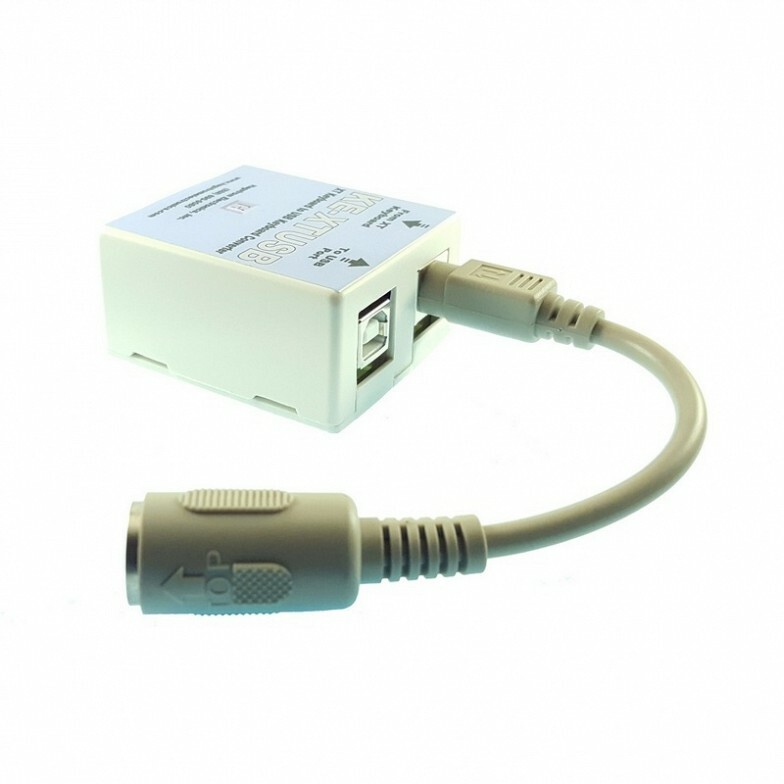 Supplied with a printed user manual, 5 pin DIN Female to 6 pin miniDIN adapter, and USB cable. Convert a vintage XT style keyboard to a standard USB keyboard! The KE-XTUSB converter accepts standard XT style keyboard input and produces USB keyboard output. 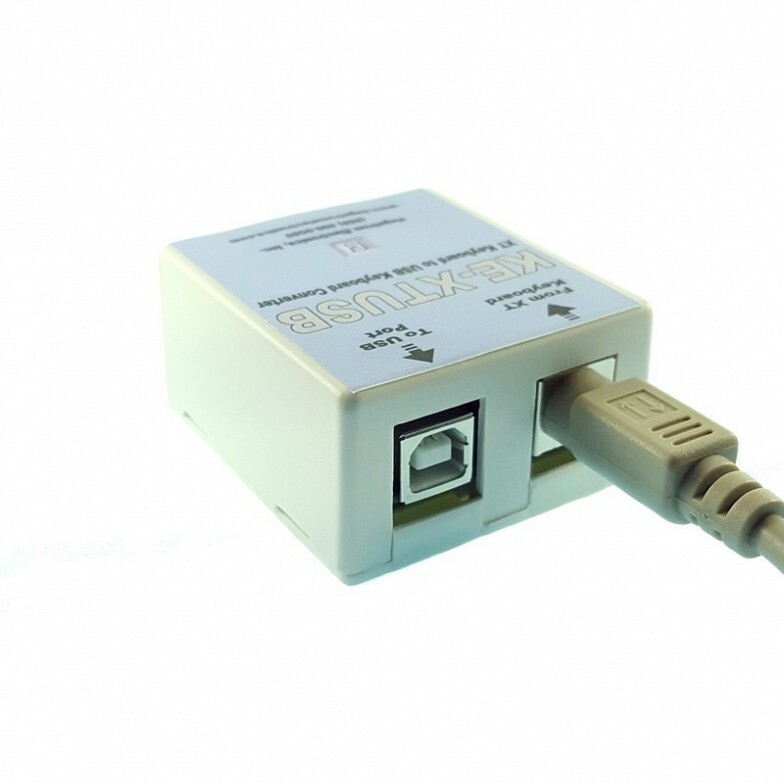 It can be used with any computer that supports the USB keyboard protocol and connects in line with your XT keyboard and the computer's USB Port. This arrangement allows for use of your favorite vintage XT keyboard on any computer with a standard USB port. Virtually any XT protocol keyboard can be used with the KE-XTUSB converter. We integrated our knowledge and experience of the various manufacturers of XT keyboards to produce a product that automatically accounts for the subtle differences sometimes found in keyboards of this type. The product uses standard system drivers, special drivers are not required. The KE-XTUSB obtains power directly from the computer’s USB port, no other voltage supply is needed. Jumper selectable mode for converting AT and PS/2 prototcol keyboards to USB. 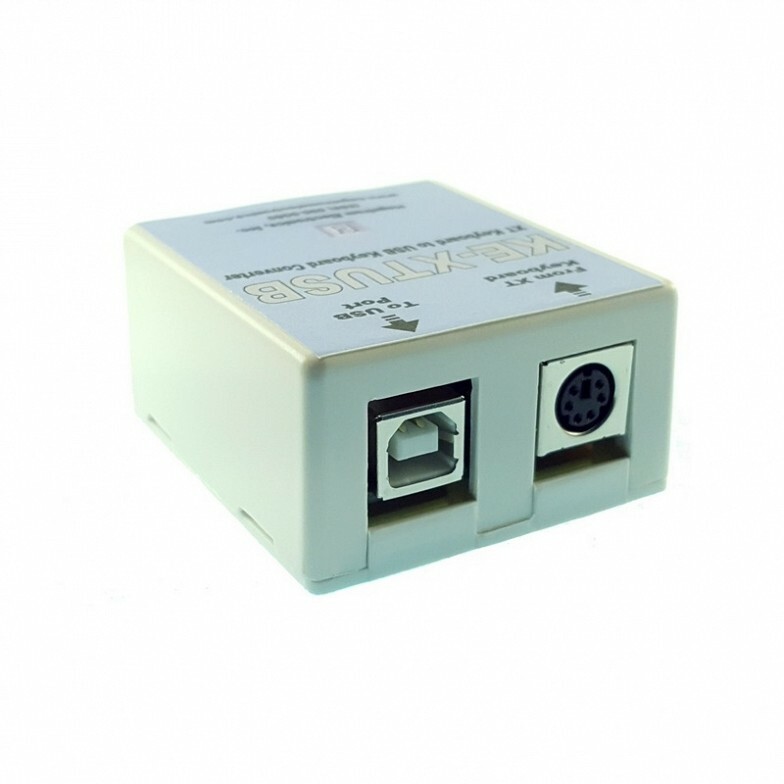 This KE-XTUSB converter comes in a small enclosure that can be mounted in a convenient location. The device ships with a printed user manual, a six-inch adapter to connect the 5 pin DIN connector of the XT keyboard to the 6 pin miniDIN connector of the KE-XTUSB’s keyboard port, and a standard 3-foot Male/Male Type A to Type B USB cable to connect the target computer’s USB port to the KE-XTUSB unit. Supplied with a printed user manual, a six-inch adapter to connect the 5 pin DIN connector of the XT keyboard to the 6 pin miniDIN connector of the KE-XTUSB’s keyboard port, and a standard 3-foot Male/Male Type A to Type B USB cable to connect the target computer’s USB port to the KE-XTUSB unit.